I have been a life long resident of the Zion/Winthrop Harbor area. Growing up I attended Winthrop Harbor grades schools, then attended and graduated from Zion Benton Township High School in 1983. Following high school, I attended Northern Illinois University graduating in 1987 with a B.S. degree in Engineering Technology. During my years of college, I took an EMT class at the local hospital with the goal of someday joining a fire department. I was hired as a paid on call firefighter with the Winthrop Harbor Fire Department in 1986. While working full time as an architectural draftsman for Zion Church Designers and Builders and part time for the Winthrop Harbor Fire Department, I discovered that firefighting was my true career path and with that I tested and was hired by the Zion Fire and Rescue Department in 1990. During my years with the Zion Fire Department I held the rank of firefighter paramedic until 2001 when I was promoted to Lieutenant/Paramedic. 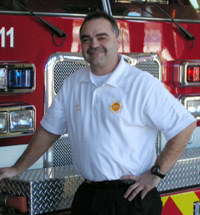 In May of 2008 I was promoted to Battalion Chief and in December 20008 I was appointed the position of Fire Chief. Prior to becoming appointed as the Fire Chief I have held the positions of EMS Officer, Training Officer and Fire Marshal with the Zion Fire and Rescue Department. Additionally, throughout my years I have participated as a member of the Lake County Dive team and Hazardous Materials response team. During my time with the fire department I have had many opportunities to learn from others in the fire service. Listed below are some of the certifications I hold. Additionally, there are many seminars and other classes I have attended to keep up to date with what is current in the fire service industry.